In the three decades between 1492 and 1522, European merchants and explorers progressed from relative ignorance about the shape of the globe to knowledge of an atlas that was almost complete. They did so in search of spices, gold, silver and slaves, but with rudimentary technology, huge courage and boundless confidence in themselves and their calculations. The exchange of flora, fauna, diet, disease and culture changed the world within a few generations. The final touches to the pattern of oceans and continents came two-and-a-half centuries later with the voyages of James Cook. Voyages to Africa, Asia, the Americas and the Pacific and the legacies of those journeys and encounters are here dramatically described through an authoritative text and an original selection of images. "Voyages of Discovery" also contains 9 facsimile documents, including an extract from Captain James Cook's diary, 1769 and the title page of Cortes' second dispatch to Charles V, 1520. 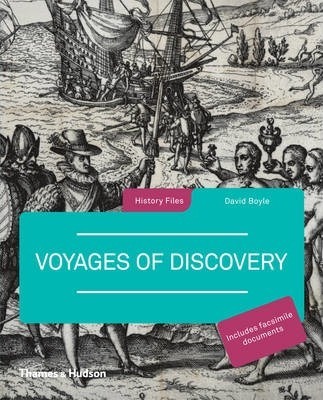 David Boyle's books include Toward the SettingSun: Columbus, Cabot, Vespucci;TheRace for America; and Voyages of Discovery. He lives in London.